The Last Night is another beautifully written novel by Cesca Major. Irina is haunted by a tragedy in her past. Unable to let go, she has lost the man she loves and her relationship with her Mother is at times strained. When she is mysteriously sent a cabinet for repair, Irina is struck by its beauty and hidden compartments holding treasures that were clearly dear to someone once. When Irina finds a number of trinkets that warrant further investigation she calls upon her ex, Andrew for help. The two of them set upon a journey together that will lead them not only to discover the truth behind the items lost, but also the truth about themselves. Decades earlier, Abigial Lovatt arrices in Devon devasteated by the death of her Mohter, her Sister and husand welcome her into their home but Abigail feels lost without her best firend Mary. Until she meets Richard and suddenly everything falls into place. Abigail is secretly planning a new life with Richard when something unthinkable happens and she knows she cannot tell Richard and instead must leave as quickly as she can. Will Richard truly know how she feels or is she just another stranger to the town? 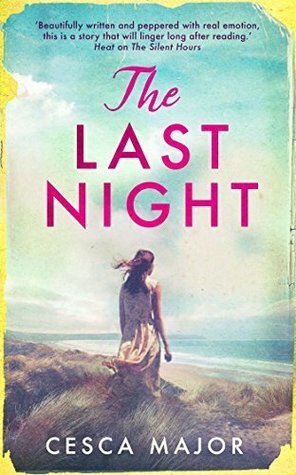 The Last Night is available now via Amazon online and all good book shops.